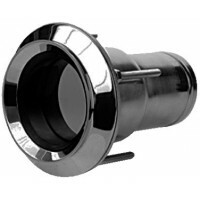 This series of stainless steal transom exhausts have a straight shank and come complete with counter..
Thru hull w/flapper - 2 inch Hose: 2"Color: BlackLength: 4-1/2"..
2.00 thru hull (white with fla Hose: 2"Color: WhiteLength: 4-1/2"..
3.00 thru hull blk w/flapper Hose: 3"Color: BlackLength: 5-1/2"..
3.00 thru hull (white with fla Hose: 3"Color: WhiteLength: 5-1/2"..
4.00 thru hull (black with fla Hose: 4"Color: BlackLength: 7-3/4"..
4.00 thru hull (white with fla Hose: 4"Color: WhiteLength: 7-3/4"..
5.00 thru hull (black with fla Hose: 5"Color: BlackLength: 9.06"..
5.00 thru hull (white with fla Hose: 5"Color: WhiteLength: 9.06".. Stainless flap with rubber seal. Cast 316 Stainless. Hose: 2-1/2"Length: 5-7/8".. Stainless flap with rubber seal. Cast 316 Stainless. Hose: 3"Length: 5-7/8"..
Black rubber with adjustable stainless steel clamp. Flap valve prevents following seas from entering..
Includes stainless steel hose clamp. 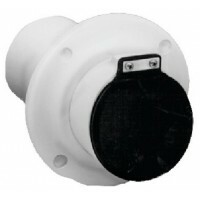 Weather resistant rubber flapper valve. 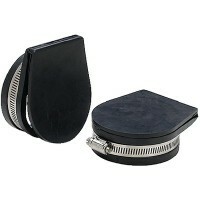 Size: 3"Description: Re..
Includes stainless steel hose clamp. Weather resistant rubber flapper valve. 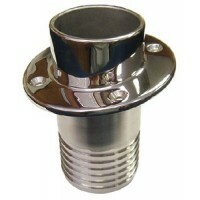 Size: 4"Description: Re..
Includes stainless steel hose clamp. 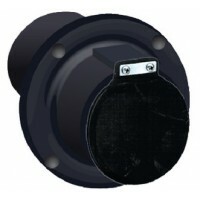 Weather resistant rubber flapper valve. Size: 5" & 6"Descriptio..